After the devastating earthquake, many people are active on Facebook and other social media. Some are posting about an earthquake relief-campaign, whereas others are updated with the latest news on earthquake and tracking latest magnitude data by clicking both authentic as well as unauthentic news sources. I will be focusing more on cracking unauthentic a.k.a fake news source. Most of the unauthentic news site starts with an unusual domain name. Let me give an example. For an example, following website does not contain authentic news source. I went to couple of fake news site and found that most of the site contain following image which says Click the following video for more info. So, If you guys accidentally went to those unauthentic news sites, then don’t click on YouTube like Ads. Those sites are targeted for Google Ads. They are paid if you click on their ads which does not play anything. I repeat DONOT CLICK ON THOSE ADS. You can directly report those shared links on Facebook by clicking right hand side arrow and finally clicking on report post. The Rest work will be done by Facebook. Also, you can report those sites by filling necessary fake news website info in the google form. For that CLICK HERE! Finally, if you follow above 5 simple steps then you will not be the victim of those fake news information. 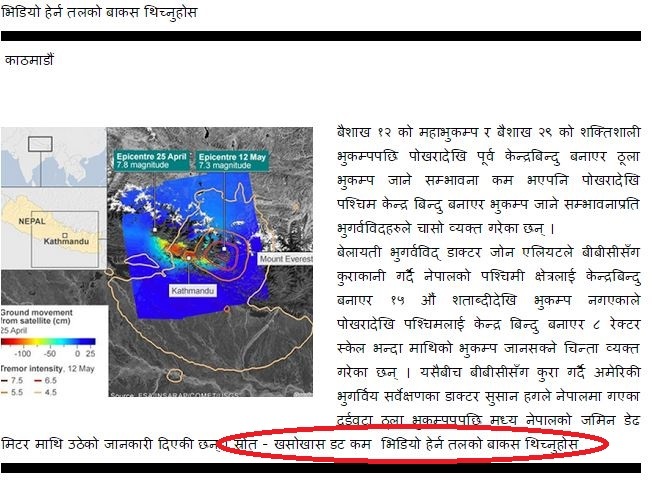 Till then, Stay safe and be updated with authentic news site such as: www.ekantipur.com , www.annapurnapost.com, www.nagariknews.com and others. CHEERS!